While you go through the process of selecting ERP software, you face a wide variety of decisions. From deciding on important functionality to making your decision on vendor and partner, the path to purchase is rife with politics, detractors, promoters, and exaggeration. That said, even if there are many gray areas in the decision process, one area exists that is a bit more black and white: Money. It’s likely you have a budget and timeframe in mind, with expectations on what a software will bring you over its useful life. There are many direct and indirect costs and benefits that appear—from training costs to automation savings—all of which should be estimated, weighted, and understood before making the final decision. In order to forge towards a final decision, one of the most important things you will need to do as a decision maker is to prove that the move to new ERP software will benefit your company and that the specific software you choose is going to pay for itself. To do this, one of the most effective ways to compare software is to analyze the potential return on investment of each software to weed out the options that pose high risk or little reward. This calculation plays a role in two parts of the decision process. First as part of the Project Justification and second as part of the final decision. Project Justification: Why Do We Need to Make an Upgrade at All? Before you even start looking at the available ERP options, you first need approval to proceed. Even if end users and department managers know it’s time to make a switch, you still need to sell the idea of an ERP project to the C-Suite or leadership team. In order to make an effective pitch to the people who sign the checks, you will need to prove that any change will pay for itself—and that the status quo isn’t beneficial. This analysis is broader than later ROI calculations as it is designed to prove the value of any project that you look to complete. While there is no “generic” ROI analysis, your solution provider or consultant can help you with cost estimates and suggest benefits and returns as experienced by other customers. It is important to complete the ROI calculation for a reasonable lifecycle for the system – at least 5 to 7 years – and include all identifiable ongoing costs as well as one-time purchase and implementation costs. In addition to discussing the benefits of a new system, one of the most important things you will need to communicate at this time is the cost of not moving forward, highlighting the ongoing maintenance costs, labor costs, and other areas where old software is holding you back. The Decision: Which ERP Platform Will Bring Us the Most Value? With approval from the board, you now have a budget in mind and can begin narrowing down your potential vendors based on their ability to provide features and functionality, ultimately ending with a shortlist of candidates who you think can provide you the best software for your unique needs. It is at this point that you will once again look at potential ROI. This time, however, you will have much more specific information on which to base your decision. By this time, you may have quotes in hand from your vendors and can make ROI analyses with real numbers to determine which software will provide you the most value over the course of its life. Much like the initial ROI analysis, this will look to compare costs and benefits of an ERP replacement, but instead of hypothetical numbers and generic estimates, you now have the power to make a well-planned and realistic comparison. For many companies, expectations from software are higher than ever, and the ROI analysis is vital throughout the decision-making process. These analyses take into consideration a broad range of costs and benefits from implementation throughout the useful life of the product. 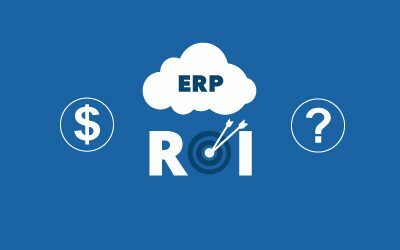 To help you make a smarter, more confident decision, our friends at Acumatica have written a free whitepaper, The ROI Analysis of An ERP Replacement, which looks at the many ways to compare ERP solutions. This whitepaper details the many ways you can quantify ERP decisions including Return on Investment, Gain on Initial Investment, Payback Period and Time to Value. We invite you to download the whitepaper here. Looking for even more information? Get to know more about Acumatica, read up on the different “editions” of this true cloud ERP platform, and see what’s new in the latest update (R2 2018). Additionally, This ERP Systems Comparison will help you to understand the basic selling points, features, and benefits of each ERP solution as you progress from long list to shortlist. Contact us for a free consultation and to learn more about the many solutions we implement and support.